In residential areas a solar power system will most likely connected to the main power grid. Because of this a first step will be to find out what regulations are in place in that particular region with regards to this type of installation. If it is an area you don’t know a good place to get advice is local retail shops that sell solar power equipment. The second step is to determine how big this system needs to be. This is a more complex task and requires that you know exactly what type of operation is required. There are systems that can function entirely off grid, systems that are connected to the grid; you will need to determine if a battery bank is necessary or desired. When the solar power installation is connected to the grid energy savings are possible because now the property owner will be able to sell the electricity he produces to the grid electrical company. In this case you will have to install an additional meter that measures the energy delivered to the grid. The more panels you have the more energy you will produce and more money can be saved from the electricity bill. In off the grid installation the solar power system must be able to handle the desire load in any condition. In this case a battery bank that can store energy is very helpful during night time. You can also have mixed installations with some of the consumers using solar power and the rest using grid power. Once you know the average annual power consumption you can apply certain formula to determine the required power capacity of the system. This calculation can be quite complex because there are many factors to consider like how much sunlight is in that area, number of hours with sunlight per day, and panel inclination. 0.7 value represents system losses due to temperature, dust, wiring etc. Homer Legacy is a free software, complex but easy to use, that can size your system and compute financial data too. No matter the type of installation some components are mandatory like the solar panels, the elements that convert the sunlight to electrical energy, the inverter that converts DC current to AC current, electrical panel to hold the fuses and switches that provide protection of the installation. It is also good practice to install a meter to monitor energy produced. If a battery bank is necessary you will need a battery charger and the batteries themselves. In some cases you might need a transfer switch to route power distribution from grid to solar system and vice-versa. Solar Power System have benefited by an increased interest year after year and will become even more popular as technology will rise their efficiency and allow it to work well in areas with less sunlight. In 2011 I attended CEATEC show held at Makuhari Messe Hall in Chiba, Japan. I was amazed by many innovative systems planned for the next years by major technology companies. 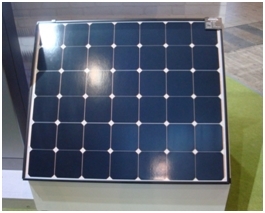 In the pictures above you can see a solar panel design by Sharp which can also act as displays increasing the number of possible applications. The so called Smart Homes and now Smart Communities are no longer concepts of the future. or copy this trackback: http://engineering.electrical-equipment.org/energy-efficiency-solar/residential-solar-power.html/trackback from your own site. I don’t even know how I finished up here, but I thought this put up was good. a famous bblogger in case you are not already.